#USvsHate is an educator- and youth-led messaging project designed to counter bigotry in schools and create safe and welcoming classrooms. We seek to unite school communities against the recent hate surge, by catalyzing ongoing learning and action. Our goal is to refuse hate together, while embracing inclusion and justice for all in our diverse society. All while providing students with opportunities to make their voices heard beyond the classroom! In #USvsHate, students participate in one or more anti-hate and pro-inclusion lessons geared toward treating people from all communities as equally valuable. Then, students create public anti-hate messages for their school communities that explicitly address, explore, and refuse racism, xenophobia, homophobia, Islamophobia, anti-Semitism, sexism, or other “hate” forms. Schools can display messages locally via school walls, activities, or websites, and send them to #USvsHate at any time for broader sharing. Three times a year, winning entries in an #USvsHate contest will be amplified nationally via our website and social media. A subset will be made into free posters and stickers for participating classrooms. Educators and students then ask themselves: What’s Next? and choose a next step for learning and action. Our 2018-19 contest deadlines are November 16, 2018, February 22, 2019, and April 26, 2019. #USvsHate can start with as little as two class periods. In #USvsHate, teachers teach a lesson of choice (ideally, a short series of lessons) from a national group of partner organizations, and spark a classroom dialogue against hate and for inclusion. Lessons on our site help students explore identity, diversity, justice, and action, in alignment with Teaching Tolerance’s Social Justice standards. ask people to treat each other kindly, fairly and respectfully, so schools stay safe for learning and society includes us all. Educators and students share messages locally to shape school climate. Then, they submit “best” student products (in any media) to #USvsHate for broader sharing. Three times a year, #USvsHate will host a message contest. 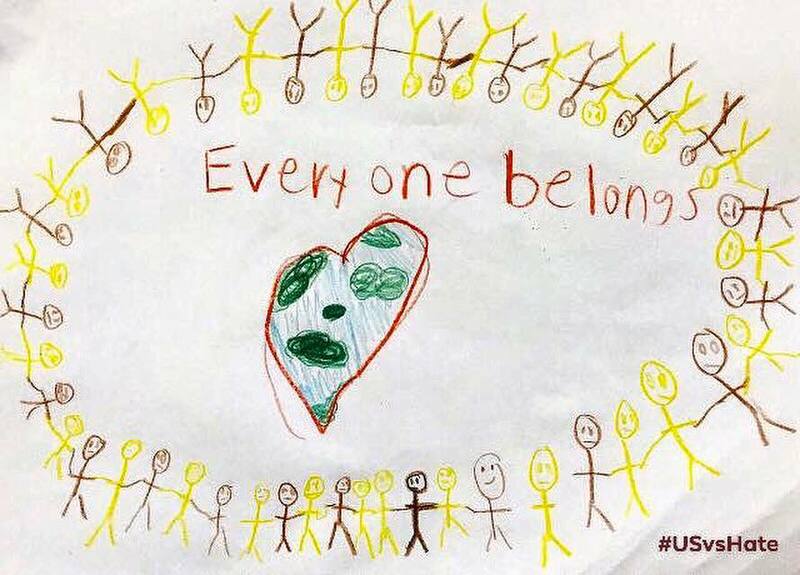 Winning entries (chosen by students and the #USvsHate team) will be amplified nationally via our website and social media, with poster and sticker messages also produced for participating classrooms. We think #USvsHate is a potential lever to put youth in the driver’s seat of powerful, inclusive, anti-hate messaging sorely needed today. We also think our frame will spark proactive clarification that ALL students and community members are part of “US”! Whether messaging ends up on one classroom wall or gets shared digitally to thousands, we hope #USvsHate’s public anti-hate messaging will help reshape the speech, symbols, and messages students across the U.S. see, hear and repeat every day. Publicly saying no to hate is our place to start. Our messages insist publicly that all people are equally important. We hope that the #USvsHate process will spark ongoing anti-hate learning and action, as educators and students ask, “What’s Next?” and start the cycle again. The hate spike has exposed our deeper problem. We don’t treat all people as equally valuable. So today, more than ever, every community needs to unite locally against hate, as the first step toward valuing and including all people in our diverse society. And every school community can help spread the message that all students are part of “US”! We like to say this has always been educators’ job—it’s just more important now than ever. build a process that can be scaled up nationally. See The Thinking Behind #USvsHate for a deeper discussion of what we’re trying to accomplish. 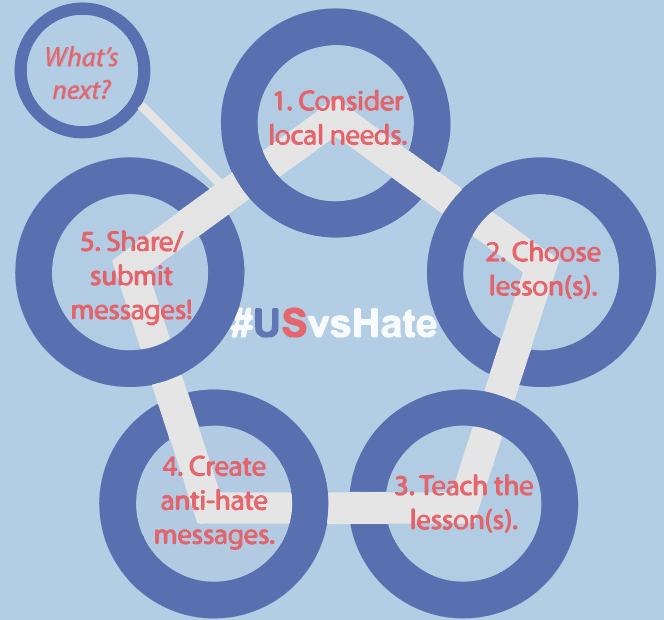 Click Getting Started to begin the simple #USvsHate process! The #USvsHate project was started by Professor Mica Pollock of UC San Diego and a team of San Diego educators, as part of Pollock’s #Schooltalking project and with seed support from Teaching Tolerance. After a successful Spring 2018 pilot, #USvsHate is expanding in the 2018-19 school year to include educators and students across San Diego County, with support from Teaching Tolerance. We hope to fully scale the project nationally in fall 2019. Join our community and help shape the work!